Spokane Fire Communications Specialist Cassidy Haas works on a call at the Fire Department's Combined Communications Building in Spokane. 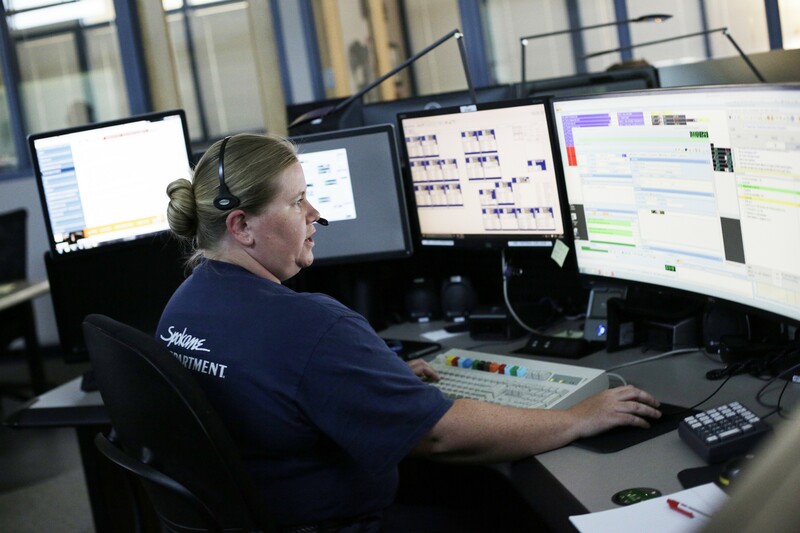 Last week, Inlander staffer Daniel Walters wrote a story about a potential plan to streamline emergency dispatch services in Spokane County. To recap, Spokane County emergency services are attempting to decrease the amount of time between when the dispatch center is called and when first responders arrive on the scene. Right now, it takes them about 2 minutes and 40 seconds. “A coalition of local government officials have moved toward creating a new public development authority — tentatively called SPOCOM — to take all the pieces of the current 911 system and put them under one organization." It turns out, this is a hot-button topic among our readers. The Inlander received more letters to the editor regarding this topic than normal. Several employees took issue with the claims made by supporters of the proposal, arguing that they didn't understand the current system. This is in response to the 911 article on July 26th: As a fire communications specialist for the Spokane Fire Department for 20 years, I am very surprised and shocked at the amount of incorrect information given about the process and duties of dispatchers, along with the lack of interaction by the people planning this [integration] process. If this change is for the better, you would think that it would be transparent, and it has not been. There have been multiple meetings, including the most recent Strategic Positioning Meeting, which is a three-day meeting where there is only one out of 29 people attending that represent the people on the floor doing the job. I am also very saddened by the fact that I have dedicated my career to the Spokane Fire Department and to helping the citizens of Spokane and the surrounding communities during emergency times of need, yet those pushing this proposed integration are not looking out for the public's best interest nor the employees that serve them. Thank you. Commissioner Al French implies that we should overlook failed efforts at integration and move forward. Specialized dispatchers save agencies money by appropriately managing resources and prioritizing responses. More importantly, specialized dispatchers save lives and property. Our current system is not broken. Could it improve? Certainly. It appears, though, that the integration committee has not considered implementing measures that could affect that improvement without completely scrapping the services already in place. Response times matter, and expertise matters. You want highly trained professionals handling fire and medical calls, and highly trained professionals handling law enforcement emergencies. Both are specialties. Public safety benefits when these specialties are preserved. The process to [integrate] has been exceedingly fast — consultants have been hired, a PDA has been formed and an executive director named, with no participation from actual dispatchers. No costs have yet been discussed or disclosed and requests for information by Spokane City Council have gone repeatedly unanswered. There is plenty of data and anecdotal evidence to show that our current, already integrated system is working. Yet improvement should always be welcome in any organization. So let's take the time necessary to be sure we actually have a problem before we throw the current model out and start over. Improvement may mean just a technology upgrade. Let's make sure the public is going to continue to receive the very best service we can give them and take the time to do it right. This is in response to the article on consolidating the 911 dispatch center. This idea of consolidation has been tried numerous times with the same outcome: failure. If this was a good idea, then it would have worked a long time ago. This is not a good idea, period. The article said this time it is more political, which is very much true. The city of Spokane's Mayor’s Office is pushing for this to happen quickly because its term is up at the end of 2019. The board of directors and all the stake holders want this to happen quickly and they are pushing it along as well. They have hired a director for a consolidated agency, but not all of the city of Spokane's employees and unions feel this is the best direction. The City Council has passed an ordinance to suspend consolidation until questions have been answered. Questions that have been asked by employees, unions, City Council members and others. Those questions have not been answered and are usually responded back with more questions and no answers. City Councilman Mike Fagan said it best: "We ain’t paving some streets here. We’re talking about saving lives." Some pushing for consolidation have stated that it will improve response times for officers. That is not true. The only thing that will improve response times is having more officers on the streets to handle the numerous incidents. Dispatchers can only send calls when officers are available to respond. This letter is only my opinion on the consolidation of emergency dispatch in Spokane. Thank you for taking the time to read this.